As you may recall, a few months ago I had posted this band's debut release after months of trying to track it down. A playful lo-fi psych throwback record that has been getting a good amount of attention on my ipod. Well, they've released a new incredibly awesome cassette through Moon Glyph Tape that might be one of my favorite things I've heard this year. 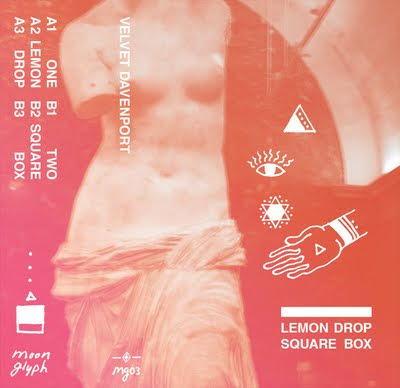 Lemon Drop Square Box is a quick listen and will have you craving more, but the band accomplishes quite a bit in a short amount of time. The usage of the sitar (or sitar effect, I can't tell) and organ in "Drop", or the slow moving melodies of "Lemon" will have you closing your eyes watching the universe unfold on the back of your eyelids. cool, thanks for the tip. just went over and bought this. square is the only one on here i'd even consider a song, the rest is just a sad little man flipping through his rhyming dictionary. so much for taste.